Remember the voice that sang Sun mere bandhu re from Sujata? Or Allah megh de and Wahan kaun hai tera from Guide, or even Prem ke pujari from Prem Pujari; not to forget Doli mein bithai ke kahaar from Amar Prem? 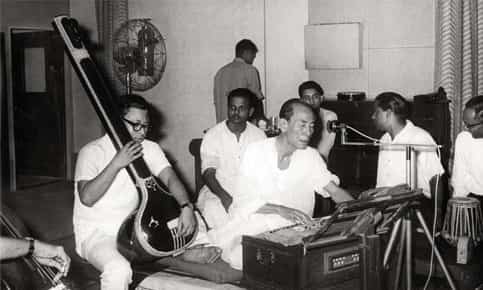 These were some of the tracks recorded in the inimitable voice of singer-composer Sachin Dev Burman, who gave Indian film music some of its most beautiful songs and soundtracks from the 1950s to the 1970s. A few weeks ago, on one of my habitual music store prowls in Delhi, I discovered a CD published and distributed by Hindusthan Records titled Hindi Songs of S.D. Burman. Despite the extremely poor packaging and uninspired album art, I couldn’t stop myself from adding it to my music collection, more so since most of the songs were not the familiar film songs I had heard earlier. And I don’t regret the decision for even a nanosecond, because the album holds a fair number of pleasant surprises, particularly for music lovers with a taste for vintage collections. The 19-track compilation has just one track that I was familiar with—the charming Dheere se jaana bagiyan mein that I remember memorizing decades ago and singing to school and college mates during lunch break. The album opens with Gun dhaam hamare Gandhiji and Sab desh ki janata tumhein ro ro ke pukaare, both dedicated to Mahatma Gandhi, with the latter being a lament on the demise of the Mahatma. But it is Preet mein hue badnaam which I would rank as my favourite from this album. A dadra in the raga Gara, recorded with sarangi, tabla and harmonium accompaniment, the 3.08-minute long track reveals Burman dada’s ease with the thumri-dadra idiom. It comes as no surprise then to find that Allahabad University invited him in 1934 to the prestigious All India Music Conference, where his rendering of a Bengali thumri was greatly appreciated. Later, the same Bengali thumri also earned him a gold medal at the Bengal Music Conference that was inaugurated by Rabindranath Tagore, says Wikipedia. S.D. Burman, or Sachin Karta as he was also known, was first recorded by Hindusthan Records in 1932, and, therefore, the tracks on the CD that I was able to get could well contain tracks that were first issued as 78 rpm records and later issued as LPs and EPs. They, therefore, bring to us the voice of a much younger S.D. Burman, a voice that is more robust than the one we heard in film songs. But the unmistakable influence of folk music is as apparent, particularly in tracks such as Chale chalo prem ke saathi. But the other surprise in the album is the song Tum ho bade chit chor sung by Meera Dev Burman. Meera Dev Burman, nee Dasgupta, was a music student from Santiniketan who met Burman dada in Allahabad and later became his student. The two fell in love and married in 1938, against the wishes of Burman dada’s family. The marriage led to his being estranged from his father and family members, but in his wife he found a companion and colleague who even assisted him on several projects. Like Burman dada, in her singing too one hears an unmistakable but charming Bengali accent as she trills sweetly Tum ho bade chit chor sajanwa. I don’t know if the album is available online, but if you are up to digging around in dusty shelves at music stores, do give this album a dig.